Who says monkeying around can’t be educational? 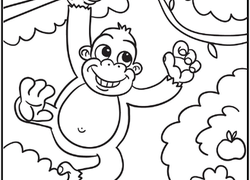 Our cleverly illustrated monkey coloring pages are designed to bring a smile to your child’s face while at the same time teaching him a thing or two about different primate species. Kids also can use these worksheets to practice their pencil grip and fine motor skills, or exercise early-math muscles with paint-by-number and dot-to-dot games. 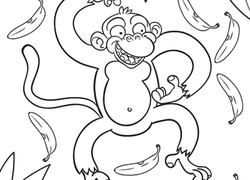 This poor monkey on this coloring page looks a little bit jealous of his friend's huge banana treat. Do you think he can convince his monkey pal to share? 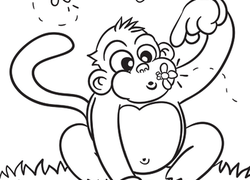 Print out this monkey coloring sheet for your animal-lover to brighten up, and boost her fine motor skills at the same time. 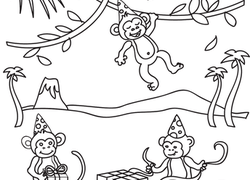 Then he'll have a blast with this cute circus animals coloring page, featuring a multi-talented monkey! This heat-seeking monkey knows just how to spend a cold winter day! 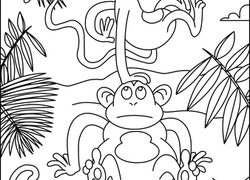 This coloring page features a South American capuchin monkey who could use some color in his fur! Color in this cute pygmy marmoset, a small monkey that lives in the canopy of the South American rainforest. Whoâs this maurading monkey, and whyâs he so mad? 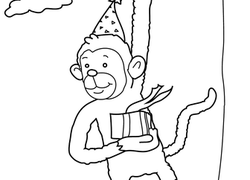 Color this simian superhero and write an origin story. Color the monkey, elephant and mountain. 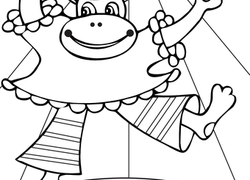 Monkey around with these monkey coloring pages! Show your child different types of monkeys so that she can point them out in real life. Take your child to the zoo and ask her which ones she recognizes!